Jean Claude Constantin is best known for his original designs and concepts, having made hundreds of different puzzles, but he can also take on a classic and give it his personal touch. That's exactly what he did to one of the best known binary puzzles of all time, the Tower of Hanoi or Turm von Hanoi in German. 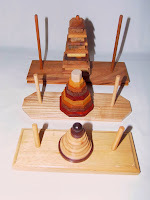 The Tower of Hanoi originated over 130 years ago by the hand of Édouard Lucas and since then there have been so many variations it's almost impossible to count them all. 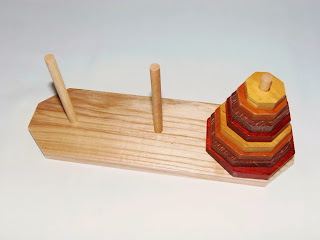 I've always been fascinated by the sheer brilliance of this puzzle, so whenever I see a cool version I have this urge to add it to my collection. The Constantin version is now my third. 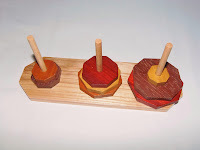 If you're unfamiliar with the concept, it's very simple: You have a base with three rods and a specific number of disks (the number of disks varies and with it so its difficulty); The starting position can be any of the three rods. The goal is to move all disks to one of the other two rods by obeying a simple set of rules: You may only move one disk at a time; You can't place a disk on top of a smaller one. The concept is straightforward and very easy to solve if you start with just a few disks, but for each additional disk the difficulty level rises exponentially. To calculate the number of moves you just have to apply a simple formula - 2n - 1, where n is the number of disks. Since this Constantin version has 8 disks, the minimum number of moves is 255, which is already quite challenging but still not the hardest one around. What made me get this particular version was the colorful appearance of the puzzle itself. Constantin always excels at this with his puzzles, using many different wood tones creating a beautiful palette. The Turm von Hanoi has four different colors alternating in two groups. 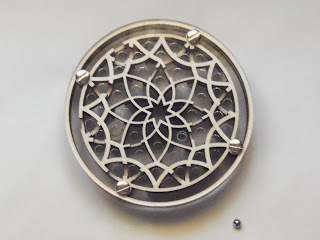 Also, each disk is carefully cut in the shape of an octagon - It's an eight-themed puzzle. The top of the pyramid is decorated with an hexagon to keep the disks in place. The size is average, measuring about 22cm x 7cm (8.7" x 2.8"). From the three versions I have, one has seven disks and the other two eight, including this one. Applying the above formula for the first it gives a total number of 127 moves. I'd say its difficulty level is about 6/10. The Turm von Hanoi, on the other hand, has twice the moves to be solved. While I don't consider this an extreme challenge, as classified by PuzzleMaster (level 10/10), It's still not a walk in the park. I'd put it at a level 8/10. With nine disks I might agree with a level 10. The key to solve it is pure concentration. The solving process is the same whether you're solving a three-disk tower or an eight-disk one. You just need much more concentration so you don't lose your train of thought, which I did for a couple of times. Solving time was about 15 minutes, but with training you should be able to cut it down by half or even less. It's a very fun puzzle to solve anytime. Liking a particular puzzle is dangerous, especially when you own a large collection. If you stick to unique concepts you'll be fine, but if you're like me, every time you see a cool new version of a puzzle you'll understand the feeling of "I must have it!". The Turm von Hanoi by Constantin is definitely a must-have. Availability: You can get a copy of the Turm von Hanoi at PuzzleMaster for $26 CAD. For other puzzles from Constantin, click here. String/Wire puzzles, or as I like to call them 'Torture' puzzles, are a rare kind of puzzles that I usually tend to stay away from but can't seem to resist for long. It's like a siren song. I know it'll end badly but still I want to believe that it's going to be different and easier this time around... It didn't, at least not with The Glasses. 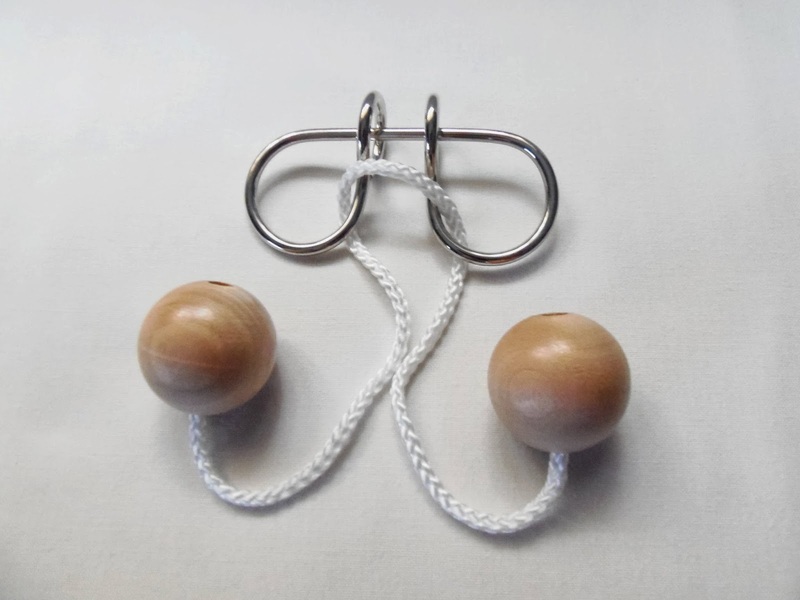 Since I've been reviewing these string puzzles from Sloyd - I reckon they were eight - I was saving this one for last due to its obvious higher difficulty and I wasn't mistaken. It's one hell of a challenge, which is odd because at first sight the design doesn't seem too much complex, even the wire frame is not very intimidating. Since you all know the concept of 'appearances can be deceiving', you get a pretty good idea of what I went through over the past few weeks. So, as I mentioned above, the design is very simple. 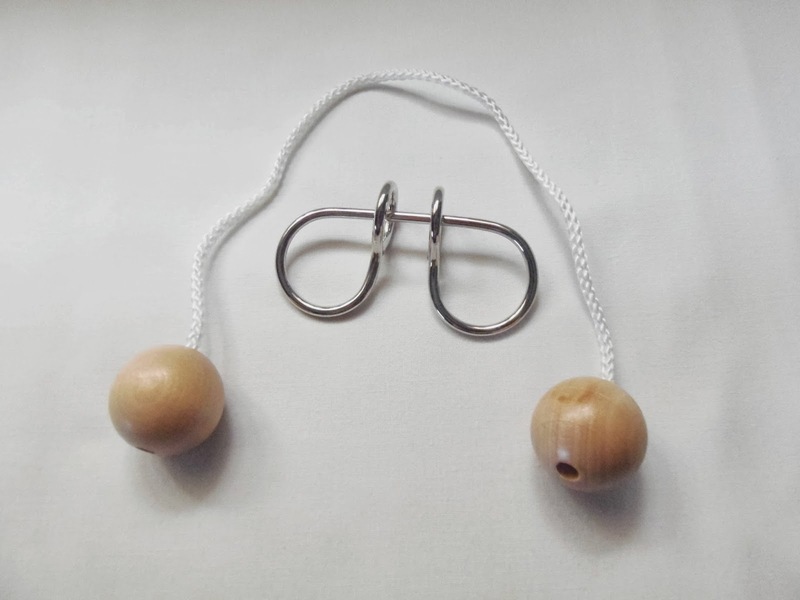 The frame is made in the shape of a pair of glasses, without temples, and attached is a string - a lengthy one I might add - with two beads at both ends. The beads can't go through the two big openings in the metal frame, so a different approach is needed to solve this fiendish puzzle. Yes, it involves knots, and knowing my history with them I always end up creating one too many. 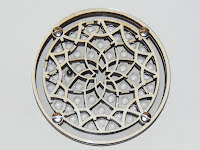 The design also reminds of The Rack, another wire puzzle. I don't own it though, so I'm not able to compare them and see how similar they actually are. The Glasses are definitely not for beginners, unless you want to end up with an unsolvable puzzle. It you like extreme challenges this is a perfect choice, but don't expect to solve it in a heartbeat. It's something to enjoy step by step, that is, if you like this type of 'Torture' puzzles. Availability: The Glasses are available at Sloyd for just €6.05. 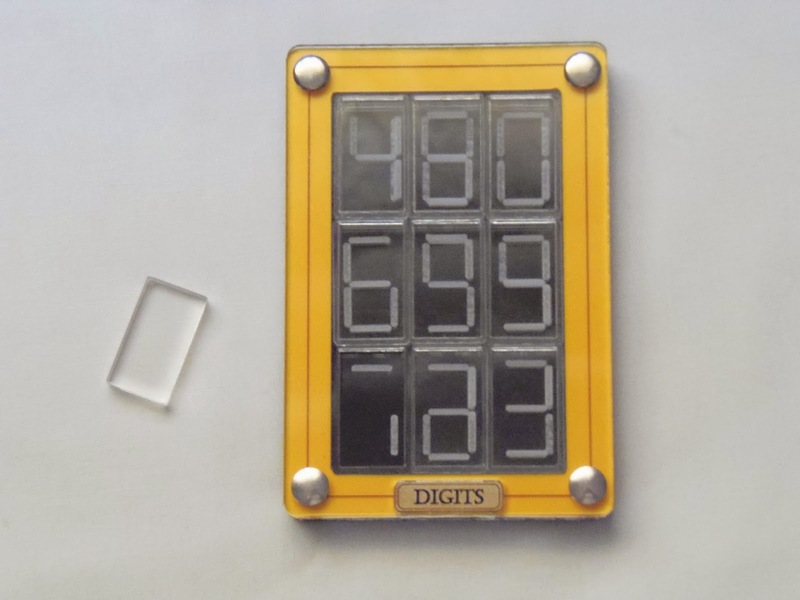 Digits is a cleverly designed slide puzzle from Siebenstein-Spiele that actually doesn't resemble anything they usually produce. Siebenstein puzzles generally have a predominance of wood in their appearance, even though some wood boards are used in the Digits puzzle. Does this make it less appealing? No way, on the contrary, as it's one of my favorite puzzles from them. 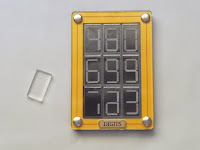 The Digits, like 99% of Siebenstein's puzzles, was designed by the prolific puzzle designer Jürgen Reiche. The design is made to look like an electronic panel of some sort. There are two colors that I know of used for the frame's edges, yellow and red. I went for the yellow, but you should confirm which colors are available when you place your order. The tiles and frame's cover are made from transparent acrylic and two wooden boards are placed between the acrylic panels for extra width. Moving the tiles is not so easy due to the acrylic grid on the top, especially if you have sausage fingers. The puzzle is not too big, measuring 12.6 x 8.6cm (about 5" x 3.4"). The concept, to be honest, is a little too similar to Grabarchuk's Puzzle Impossible, but since that's another one of my favorites, I don't mind... Much. 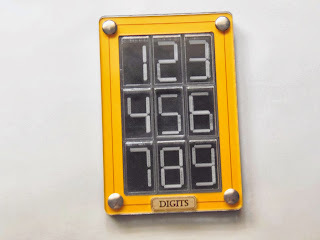 Okay, on the surface the Digits puzzle looks like any other ordinary 3x3 slide puzzle, but when you start to move the tiles you're in for a surprise. The digits will begin to change every time you move them. The shape you see for each number is a combination between the segments on the tiles and the surface of the puzzle. When a combination doesn't match you'll see a different number that doesn't belong there. One of the differences between Grabarchuk's and Reiche's puzzles is that on the Digits you'll see a random number most of the times no matter what moves you make, give or take the occasional oddness (see picture below), but nothing like the Puzzle Impossible. This can be either good or bad, since you could lose track of your progress if you lose your focus for a moment, but at the same time you don't see those wacky shapes that can be quite confusing. 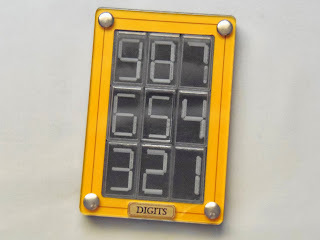 In my opinion, Digits is way easier than the Puzzle Impossible. 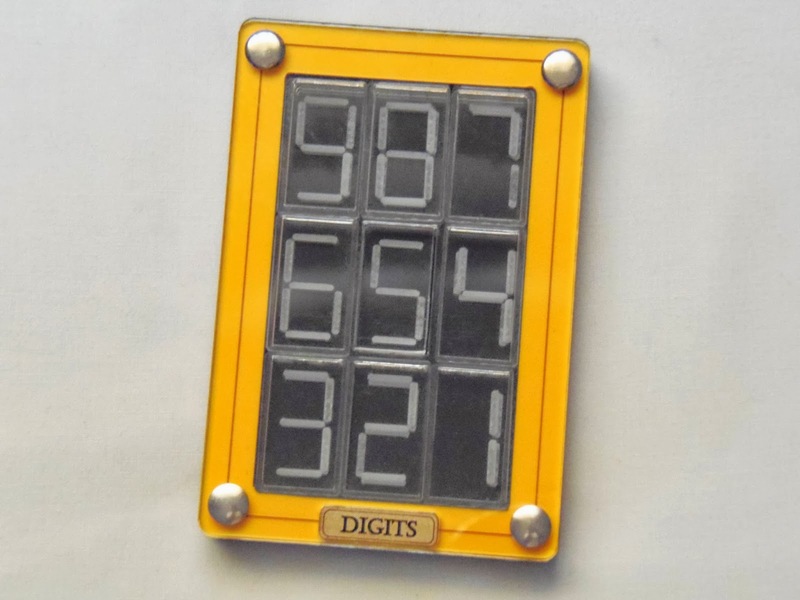 The challenge on the Digits puzzle is also much more straightforward than its cousin. It comes with the numbers in sequential order from 9 to 1, starting on the top, and your task is to shift the numbers in the opposite pattern, starting from 1 until 9 from the top. I didn't check all the numbers, but I got the impression that the exact same tiles can be used for the same numbers in both patterns. For example, the tile that forms the number 1 on the bottom right is the same for the 1 on the top left, and so on. You could mark the tiles with post-it notes to make it easier, but to make it more interesting try to solve it "blind" using only your concentration as a tool. This is rated as a difficulty level 9/10 (6/7 on the manufacturer's scale), but after solving it within five minutes I reckon it's more like a 7/10 at best (or 4/7). 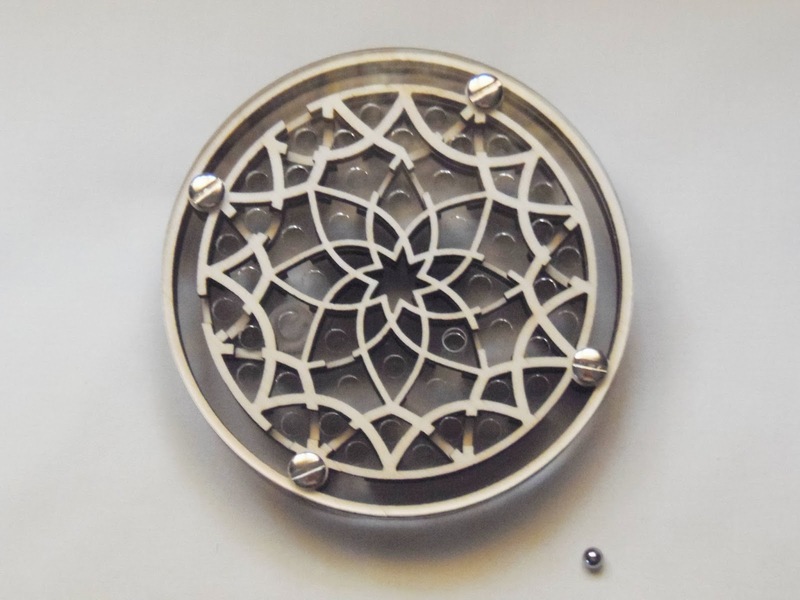 The mechanism is the same as a common slide puzzle, it's just the appearance that makes it harder. Digits may be a little different from what you're used to see by Siebenstein-Spiele, but knowing their style it's actually a great departure from their wooden haven and a bold design approach by Jürgen. I'll be eager to see more creations like these from them. 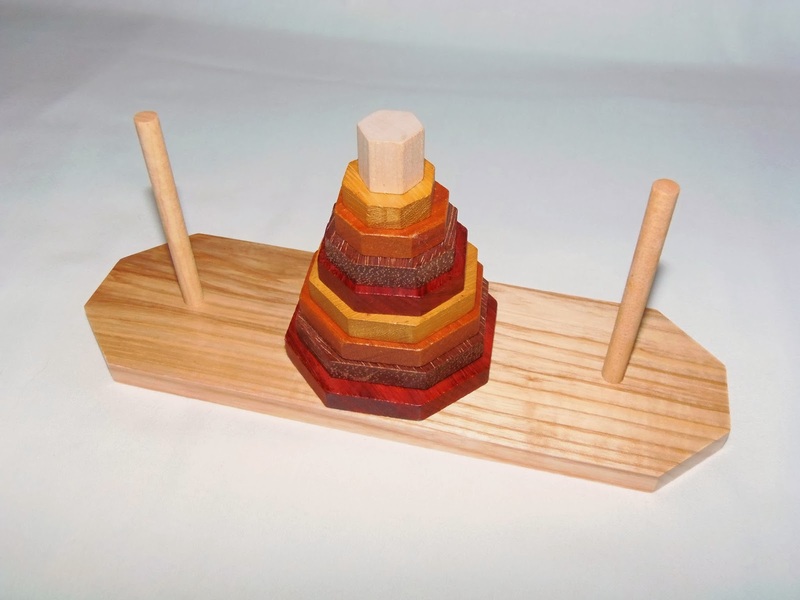 In the meantime, if you're a slide puzzle fan, this one shouldn't be missed. 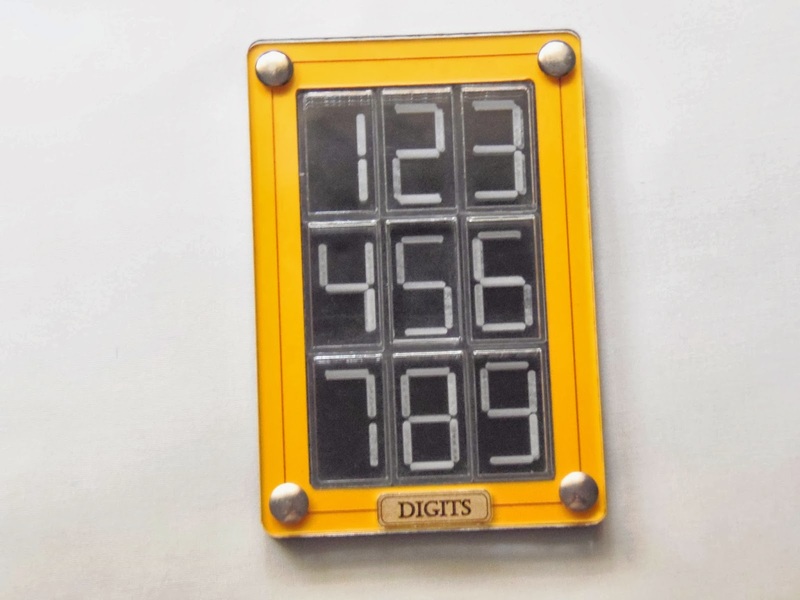 Availability: You can find the Digits puzzle at PuzzleMaster for $25 CAD. You can also browse dozens of other designs by Siebenstein-Spiele. 2D Packing Puzzles come in all shapes and sizes and the design possibilities for these flat brainteasers are almost endless. SmartGames, a Belgium company, makes great puzzle games, and quite colorful I might game. One their best Packing Puzzles comes from the mind of Raf Peeters, who's behind most of their new ideas. 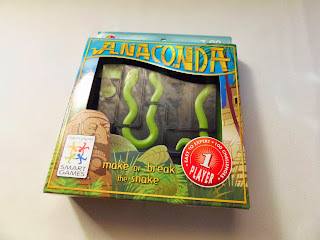 From the depths of the Amazon, meet Anaconda, the logic game that offers you 100 fun and challenging puzzles to solve, from beginner to expert. 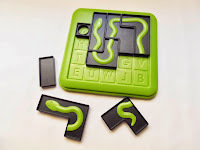 The design of the puzzle matches very well with its theme with a pale lime-green color. The black used for contrast highlights the color even more so that the contours of the Anaconda can be well distinguished. There are eight pieces, seven of them featuring parts of the Anaconda. 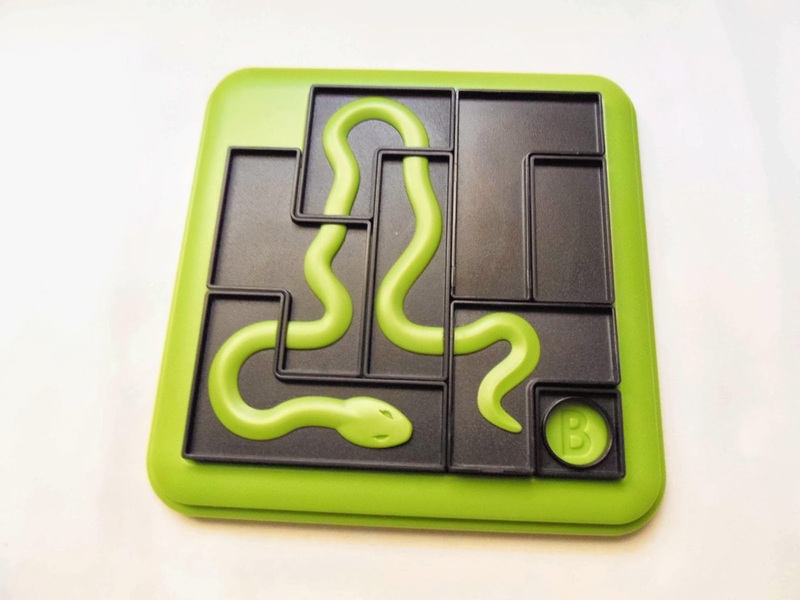 All tiles are double sided, but only a few of them have parts of the snake on both sides. The eighth tile is more like a reference, showing a different letter depending on where it's placed, and you use it on all challenges but you may never change its position. To start playing, simply select a challenge from one of the five different difficulty levels and place the first pieces on the board as shown. 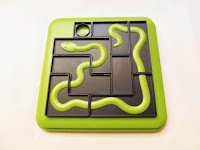 Your task is to make a complete snake with a head and a tail, no matter its size, with the remaining tiles. You must use all pieces even if they aren't used to make the body of the snake. Just place them with their black-only sides facing up. The first challenges are quite easy with up to four starting pieces plus the single tile, but good to make you acquainted with the puzzle's mechanics. As you progress to harder levels the number of starting pieces diminishes until you get to the 'Wizard' level, where only the single tile is used as a starting point. In this level there are no more references as to how the snake should look like. 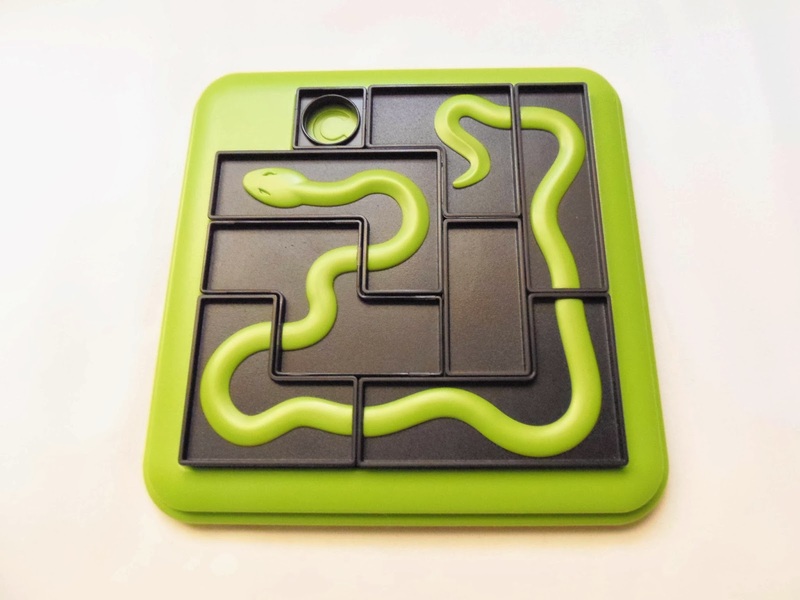 The goal is just to make a snake with all the remaining seven pieces without moving the starter tile. 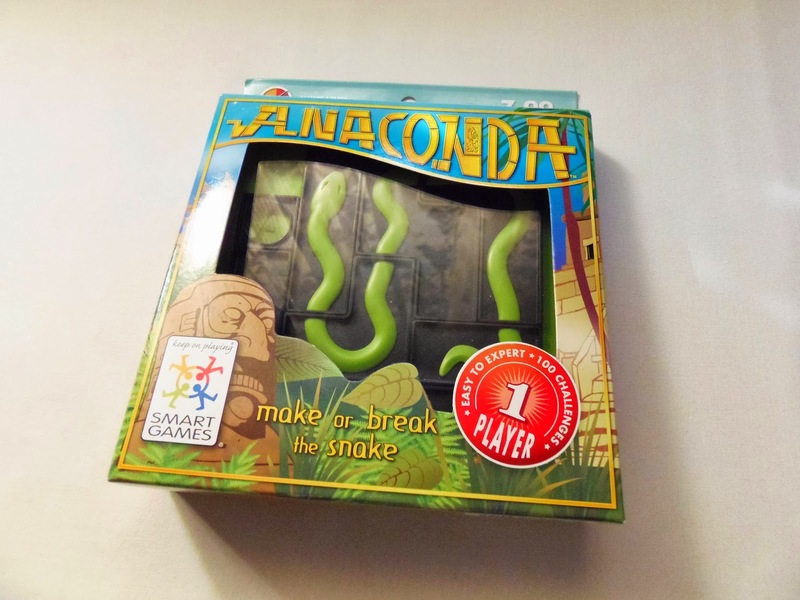 Anaconda is one of my favorite puzzles from SmartGames. The idea and concept behind it is so original and refreshing that it makes you keep coming back for more. Also, its 100 challenges ensure that you'll have plenty of fun for a while. It's highly addictive and a must-have for Packing Puzzle enthusiasts. Availability: You can get a copy of the Anaconda puzzle at PuzzlesdeIngenio.com, in Spain. For more SmartGames click here. Just yesterday I was talking about how Jean Claude Constantin gets his inspiration to design puzzles and how most of the times it's a complete mystery. And like yesterday's review, where we might have caught a glimpse of how his mind works, today's puzzle lifts the veil a little more. 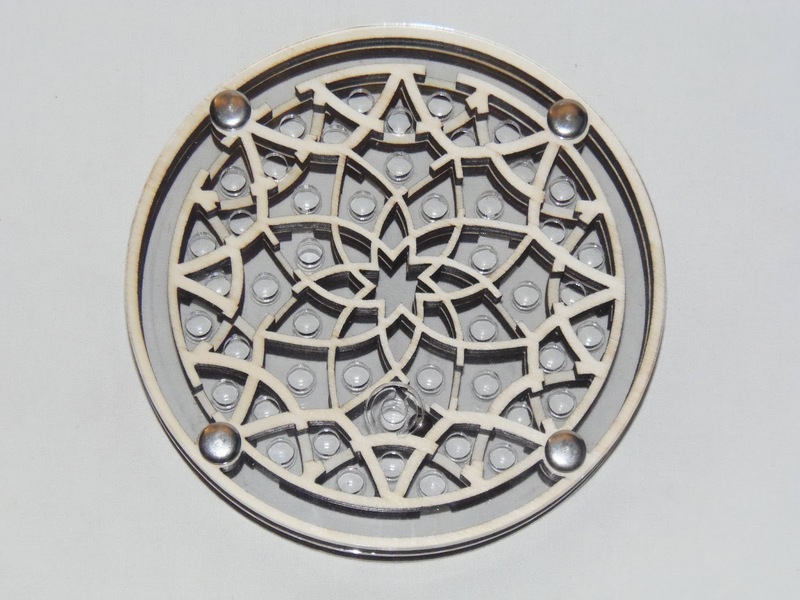 Blumenlaby 6, a stunning work of art and craftsmanship is among his best works yet, and his inspiration came certainly from the beautiful geometric Arabic patterns. The name, even though I'm uncertain, suggests there might be more versions of the puzzle out there. Indeed, I know of at least another version, the Blumenlaby 8, but I've only seen these two and they're not widely available. At first sight, the two versions look identical, so I'd have to see the two side by side to make a comparison. The only noticeable difference is that the Blumenlaby 6 is a little bit smaller compared to the Blumenlaby 8 (both 13cm and 17.5cm in diameter respectively). Even though the Blumenlaby 6 is smaller you won't find it much difficult to see where you should go at all times. If feels quite comfortable to handle and maneuver. The puzzle consists of two seemingly identical mazes in appearance but they're actually different in the way the paths are cut in the wooden walls. 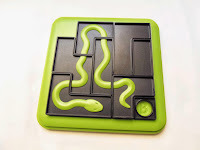 Between the two mazes is an acrylic plate full of holes where the ball can go from one maze to the other. Starting in one side, the goal is to navigate the ball to the exit on the opposite side. You'll be jumping constantly from one maze to the other by just falling into the holes in the acrylic, but be careful with dead-ends. Some backtracking might be needed. 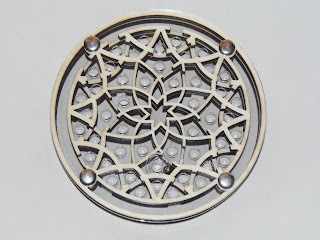 The Blumenlaby 6 is a gorgeous design and one that should not be missed, despite being easier than it looks. Nevertheless, it's a wonderful puzzle to play with and looks great anywhere you put it. It's perfect to convince a non-puzzler of how awesome puzzles are. Availability: My copy of the Blumenlaby 6 came from Brilliant Puzzles but, unfortunately, it's out of stock at the moment. You can check back the site often or, in the meantime, browse other puzzles from Constantin that are currently available. Usually, it's a mystery where Jean Claude Constantin gets his inspiration from to design most of his puzzles. However, judging from the puzzle I have here today, I reckon he even gets inspiration from his breakfast. Meet the Blume Orange, a nice little puzzle in the shape of an orange cross section. 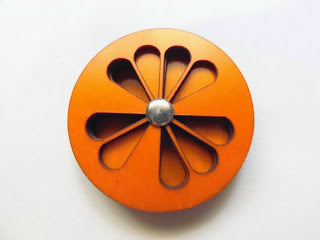 The concept of the Blume Orange is a bit similar to another puzzle by Constantin that I already reviewed a while ago, the Marguerite. It also reminds me of the Transposer Puzzles. It consists of four layers, each with twelve segments - curiously enough a typical orange has ten segments - of which nine are hollow and the other three are covered. By rotating the four layers in any direction you'll need to cover all hollow segments so you can't see through the puzzle. 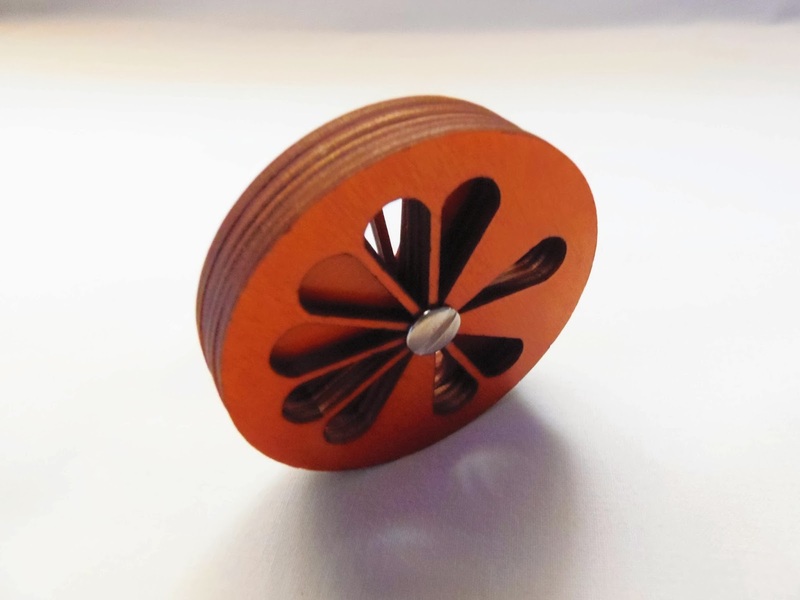 The puzzle is quite small, with a diameter of 6.7cm (2.6"), which is actually slightly smaller than an average orange at about 7.5cm (3") - Yes, I do research these numbers so you don't have to... The material used is not high quality wood - looks like plywood - but it gets the job done and the rotation of all four layers works really well. The chosen color for the puzzle is pretty good though, with a pale orange tone, apparently with a glaze finish applied. Solving the puzzle was actually a pleasant surprise, having found it a bit harder than I was expecting. At first sight, it doesn't look much tough given the fact that you only see four layers and there seems to be not enough to pose a real challenge. Wrong! In fact, although both the Blume Orange and the Marguerite are classified as a difficulty level 8, I reckon the Marguerite is more like a level 7 and the Blume Orange a deserved 8. It took me about 20 minutes to solve this thing. I'm not sure of the exact number total positions but it gets mixed up pretty quickly as opposed to solving it. 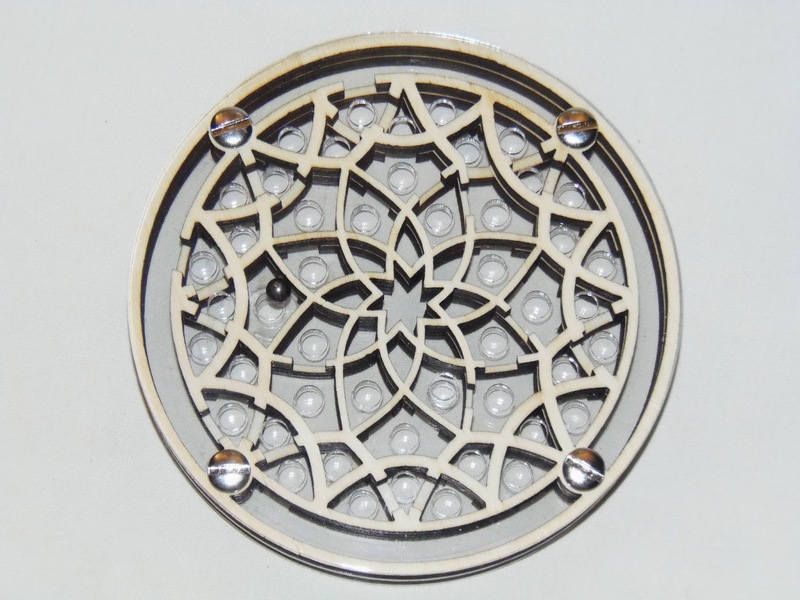 Also, I believe there's only one solution, seeing as there are four layers, each with a different arrangement of hollow/covered segments, and there are three covered segments for every nine hollow ones. 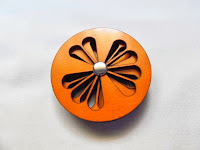 The Blume Orange is a typical Constantin puzzle: An original shape combined with an interesting concept that looks so simple and yet quite challenging to solve. The goal is so straightforward that anyone can pick it up and try his luck. Some may quit in frustration, but I'm sure everyone who tries it will love it. 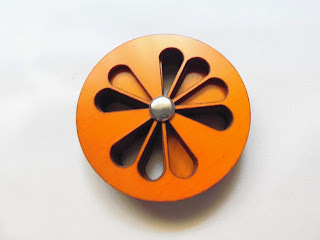 Availability: At the time of writing the Blume Orange is out of stock at PuzzleMaster, but be sure to check it out often and you might get lucky. In alternative, you can browse many other great designs by Constantin.